Something special this month: besides the stunning collection of elegant, gently used furniture and other household items you normally find at The Gathering Place Warehouse Sales, prices on sofas are drastically reduced. Every sofa’s price has been cut 50%. And prices on select other merchandise are now 20% off. Click here for a look at just some of the items available at this sale. Saturday, August 9, 9 a.m.–1 p.m.
Sunday, August 10, 10 a.m.–1 p.m. 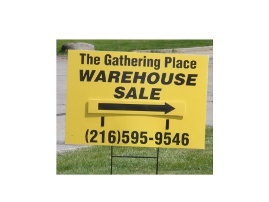 The Gathering Place Warehouse accepts gently used furniture and other household items for resale. If you have items that you would like to donate, please contact Outreach Coordinator Cheryl Apisdorf (216-595-9546 or apisdorf@touchedbycancer.org.). Please note that The Gathering Place does not accept drop-off donations of furniture or household items at its Beachwood or Westlake locations or at its warehouse.